I have just picked up my new North Mono Kite, and hope to try it in the next couple of days. First impressions are excellent build quality and a reasonably high aspect ratio plus the new Airport air valve is brilliant! I fly all of my North kites on 5 lines, so will fly this on 5 lines as well, until I can get myself a 4 line bar. I have a late model Blade 4 line bar, but don't know enough about this kite yet, to try this. Also not sure whether you can change a North 5 line bar to a 4 line bar? Until I unpacked this at home, I had never seen one of these, except on the net, but have always been interested in one strut, or strut-less kites, so maybe a bit of a gamble, will find out soon enough and intend on posting a flight review, once I've had a good session on it. It will fly alright on a blade 4 line bar. There will be a slight difference in line lengths due to the difference in the Y split height so you'll need to tune the line lengths (Probably need an inch or two of trim to stop it luffing) before you go out. Looks better in the blue that the yellow and green I got. Have fun. Looks like a good foiling kite. Nice and light. Thinking of getting one of these or a Liquid Force Solo for using with my HF. Will be interested to hear your thoughts on it. I have been using mine for learning to foil. Flies pretty much like my friends Neo. Does hang in the air pretty well during the lulls and has enough low end to get you out of the water when its light. In retrospect the 9m is probably better than the 12 for foiling but it is my most used kite for foiling as it drops power nicely so I can hang on in the gusts. I'm less impressed with it on a twin tip. Its a bit bland. Doesn't do anything badly but doesn't excite you either. I'm no surfer but it works nicely for me on a strapless board. For my money, the solo would have to be pretty cheap to be worth picking up over a mono. I used to have one. The mono is a lot faster turning and feels way more precise than the solo. The solo felt like the old delta kites to me. Plenty of low grunt and huge bar pressure pretending to be feel as the wind picked up. Ok thats good feedback from someone who has flown both. Might have to consider the North a bit more seriously. margs crew are frothing on the new 7m mono. its got stacks of bottom end , light as a feather touch and good turning speed. I've flown my Mono 7, 2 times in Brazil in "light" winds and more powered. Worked fantastic on surfboard. Then I got a 12 on sale too, been out 2 times, once from light to over powered and 2ND time way overpowered. has lower top end than my Core XR3 12m, probably 4-6 knots lower. But better low-end and faster, nimble and still light on the bar. Tradeoffs.. Finally got to fly my new Mono kite is less than ideal conditions. Wind was 20-22 kts seabreeze, with sloppy surf around 1.5 feet. Most of the other kiters were using 10 and 8 metre kites, and normally, I would have taken out my 10m Rebel, but I was determined to try this kite! I used it on my 5 line bar, and noticed that the 5th line was quite loose, so it was effectively flying only on the four lines, and not a loaded 5th like the Rebel. Never felt overpowered with 2/3 depower on, and definitely no flapping of the trailing edge in fast turns. Very light on the bar and fast turning for a 12m kite, plus the jumps were very floaty, but the wind was also quite strong for this size kite. Can't wait to try it in clean surf and cross 15-20 knot winds, because I think that this may be a really good surf kite, being so light. Overall, really happy with it, and would make a great travel kite because it packs down to nothing and could easily be packed into the bottom of a normal suitcase, as it is physically very light. I'd like to demo a mono, the single & struttless kites I have flown have not had the performance that I'm looking for. What is it you are looking for? You are unlikely to find a big boosting kite with 0 or 1 struts, nor high wind stability (even 3 strut kites generally suffer in comparison to 5 struts). BRM cloud aside, they come with fat leading edge profiles to give the shape so you're always going to have a kite that sits back a little compared to a high aspect kite. Light weight is the new 'pully-less' at the moment so plenty of other options if the design constraints of low strut counts don't give you the qualities you want. I'm after a fast - light wind surf kite, that doesn't flap when sheeted out & good relaunch. The REO from ozone is fast and light surf kite. The North Mono was one of those kites that I was reluctant to demo when we got all the new season kites. I riiged it through duty, not because I was excited by it as my experience with one strut kites was less than impressive. Pumping up is ridiculous, soooo quick with the big Airport 2 Valve from North and only a single strut. The early model one strut kites from the likes of F-One and Airush etc were very fat to give stability and foil entry shape. The North Mono has a normal diameter leading edge comparable to any other kite of equivalent size. The aspect ratio of the kite is VERY similar to the North Dice which really surprised me, as I too was expecting a more "fat" delta style shape. Nothing could be further from the truth. The higher than average aspect of the kite is exceptionally deceptive. I reckon it looks like a Dice with its extra struts removed. The Mono is very light physically and is ideal for travel and surf as well as freeriding. I've used it on twin tips when powered and on a surfboard in the surf and it is surprisingly good at both and even boosts respectable jumps. The canopy is very taught on the Mono when there is tension on the back lines, not a wrinkle to be seen! The upwind ability is on par or better than most of the rest of the North range of kites with exception maybe of the Rebel. Is there trade offs? Yes, of course. You lose top end or high wind range. There is a vast amount of unsupported canopy which, if flown outside of it's wind range) will flutter as you depower the kite. If you respect the designed wind range of the Mono, you'll never have to worry about it. Expect to lose about 5 knots off the top end. We have been using the Mono's in our school this year and they have been performing brilliantly. Students love them because they are plug and play, user friendly power and control and ease of launch. Instructors love them because they depower fully, relaunch easily and are quick to setup. They are also amazing when flying in lighter winds as they weigh very little and can fly easily in light wind. 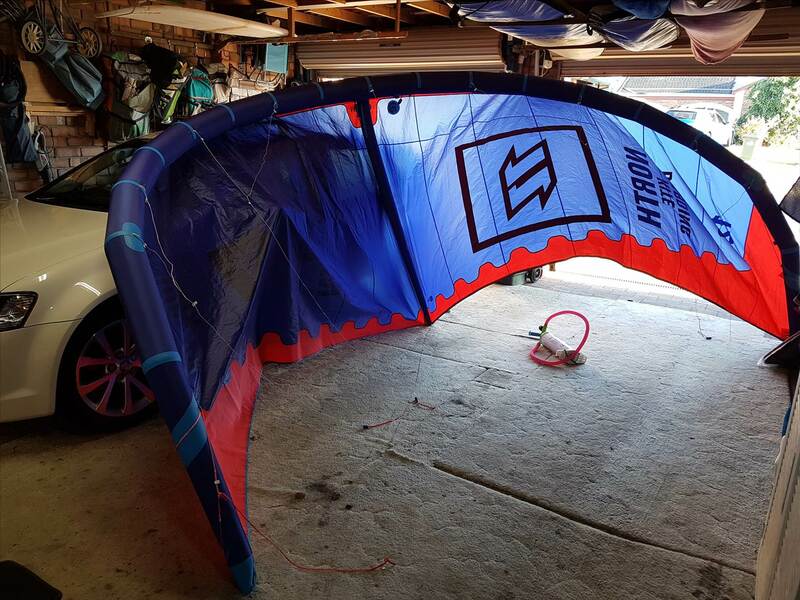 I will be taking Mono's to Mauritius this year as my surf kites for their de-power and light weight. These are not necessarily beginner kites as they have excellent performance but offer so much more. Never been a kite more deserving of a demo than the Mono. It's the total surprise package. May well be worth a demo then. My mono experience is on the 12m only so bear that in mind that the smaller sizes are more likely to be a bit tauter in the canopy. I'm riding the North quad bar. I'd generally see the kite as a cheaper Neo (haven't owned a dice other than 2014 model so I don't see the comparison myself). I'd say it turns about the same, drifts similarly (possibly a fraction better in light winds) and relaunches about the same. Low end power is possibly marginally better on the mono - but my mate rides his Neos on the freeride settings so it may be the same if both are on the surf setting. Neo high end is a noticable amount better. Relaunch is pretty good. Though I don't surf waves (as we don't have any) so expect the usual trouble if a wave crashes over and tumbles it. I did have to swim in once when wind dropped to about 8 knots and I took a tumble. Wasn't able to coax the kite back into the air. This may be partly inexperience as I was concerned about my foil moving into the lines and I may have persisted on a directional. There is some flutter of the canopy - although I mainly notice it at the top end and when cranking really hard turns. It wouldn't put me off though. The canopy is well stretched and I don't remember any flutter when the kite is sitting at 12 sheeted out (learning to foil I have spent more time like this than I'd care to admit getting the foil in position without cutting my shins to bits) even in low wind. Whilst not the lightest kite (loads of bump patches and reinforcement), it should be tough enough for a tumble in the surf and is lighter than a normal kite so you do need to weigh it down on the beach or even in modest winds it'll start to move along the beach. The good thing about North is its dealer network for demos. I have some Ocean Rodeo flites that are equally as light but aren't surf kites (turn faster too). I gather they are now putting the weight savings into their prodigy surf kites. I suspect you could get a 3 strut surf kite for a similar weight but whether you have a demo nearby is unlikely. The mono is a decent kite in its own right - and the best single strut I have come across but you may get equivalent weight savings from a lighter built 3 strut kite? Yeah I like the look of that - one to demo for sure. 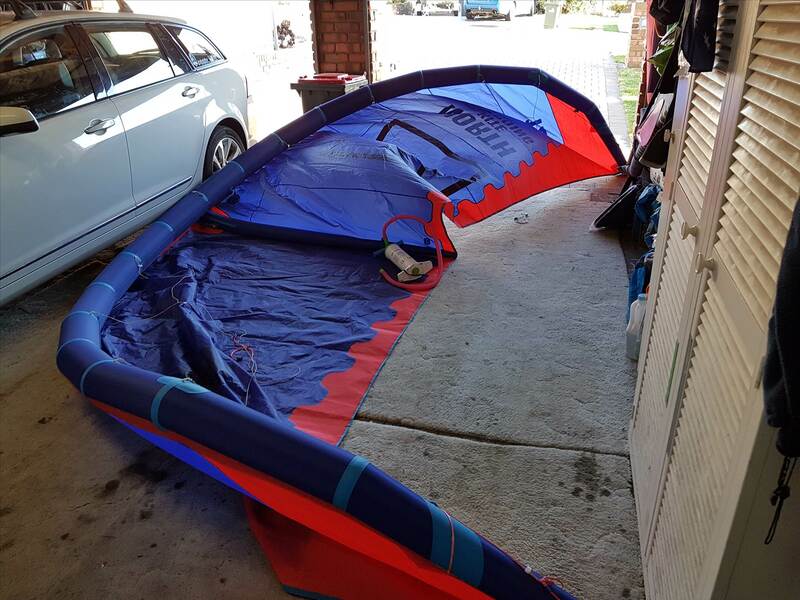 I have a 12m one strut kite as well and I can see other trade offs that are worth pointing out for the potential buyers. 1. The canopy being unsupported flaps a lot more than a 3 or 5 struts kite. Expect the kite to wear a lot quicker than a standard one if you leave it on the beach for too long. 2. Although they fly well in the surf, if you drop it and water goes over it, it is pretty much game over with pockets of water making relaunching very difficult. I think they are awesome for foiling though. Being so light, they just float so well in lighter winds. My 12m gets me going on the foil from 7-8kn. That's exactly my experience as well but are you talking purely about the Mono, or another similar design ?? How much do you weight Livit? I am 83 k's and and can get a 10 Reo flying on my foil in 7 to 9 knots. One of the things I am discovering is that any kite that drifts well works great for foiling. 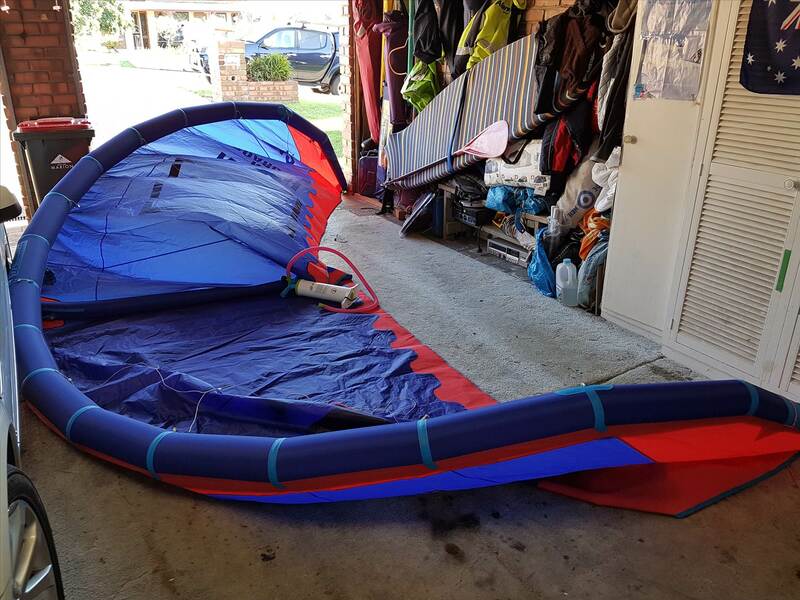 I have been riding a 6 meter Cat (new model school kite) when the wind kicks up to 20 knots and this is a lousy kite for foiling as it does not have the same drift and does tend to keep steering downward. It is still useable, but no where near as fun and stable of a ride. I have not had much of a go on the Mono but one of my students purchased a quiver and I have been teaching her with her kites. It's actually quite a nice and nimble kite, and as mentioned, feels super light in the air. It is another similar design. I have seen the mono doing the same though. At 7-9kn and a 10 reo I am assuming you must be using at least 30-35m lines unless your wing is 800+ surface area. I am quite amazed that a Reo can fly in such light wind. How much does the kite weight? 25 meter lines, paipo board (so no real float just a planing area) and 10 Reo. The foil is a freestyle foil. In order to get up and riding I have to hold the rail with my back hand and do a down loop with the kite. That pulls me up and out of the water and foiling in one motion. Once I am up and apparent wind speed is up it's all good. I got 18 kilos on you so it shouldn't be a problem. What kind of foil are you riding? Ozone Reo seems pretty light weight. According to Ozone the 10 is 2.8kg and the 12m is 3kg. 9m Mono is 2.8kg and the 12 is 3.2kg (I think). I don't know how Ozone have measured the kite (without bridles etc) but its definitely a light kite which should be good for the upstroke in light wind. I'm guessing they sacrificed some of the bump strips and protection to keep the weight down (e.g. Switch Nitro is approx 4.5kg for 12m with all the reinforcement that has). The mono has the usual reinforcement you'd find on any other North kite. 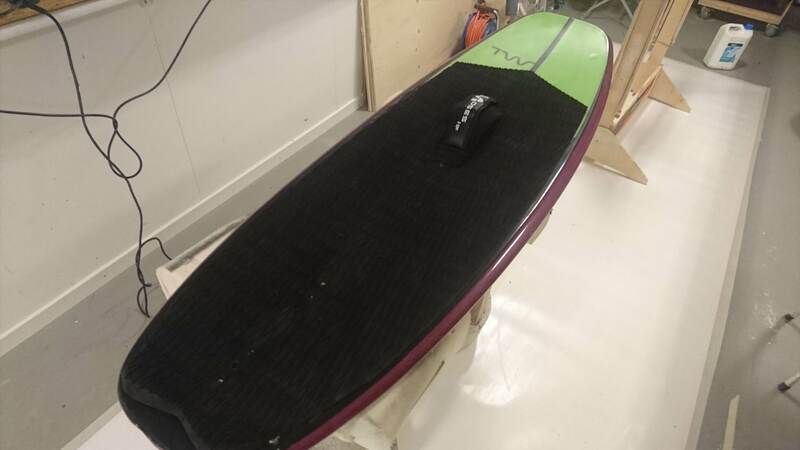 For 2017 North are introducing a 15m mono this could be an epic light wind wave kite!! I've been out further 3 times on my 12 mono in light conditions. 2times on foil ( I'm noob that is flying) and once on surfboard. Other lighter kiters were on 12S mowing the lawn, a 14 that had decent power and a 80 kg dude on a 14 and alaia board. Must of been 10-14 one day on surfboard 8-12 on foil days. On foil it was full on powered, had to sheet out a lot and fly it smart. Others were not going up wind. Surfboard day was a lot of fun. Fast, nimble, light feeling, great drift and progressive power band when sheeting, not on-off. Canopy is tight with back line tension, but te and tip canopy flutters when sheeting out, but doesn't bother me. Selling my Core XR2 17lw. Tom what do you weigh and what SB were you on and dimensions? Informative vid, thanks. Will have to give the solo a crack as well. Ok so this might be a bit of a long shot but I was wondering if anyone could comment on the low end of the mono compared to Naish pivot, I have a 10m pivot and am wondering if a 12 mono would be good for the next size up. I have a Mono 12, but never been on a pivot. Im 80kg, ride slop on my surfboard. In 12-18, in past I would usd my Core XR3 12m, or now the Mono 12. The Mono is faster and lighter feel, drifts better. But if wind is gusting over into 18-20 the Mono is becoming a handful, while Core is good to 22. Basically, the range is lower, and narrowed on top end. If wind is 10-16 I'll take my Core XR2 17lw on the surfboard, but foiling now and will do that now in 10-18 knots with 12 or 9 kite.